When it comes to DIY home decor, rugs are often overlooked. 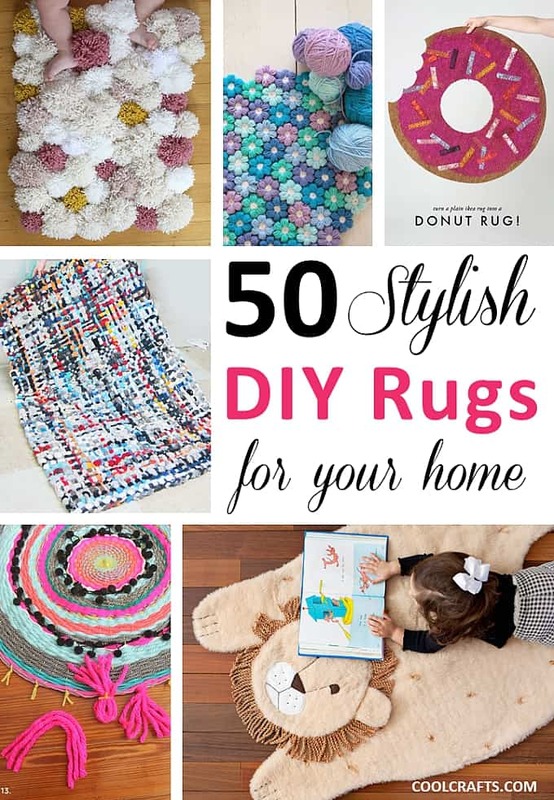 Not today though, as we have rounded-up 50 of the most stylish and clever do-it-yourself rug projects that you’ll ever find! Whether your style is minimalist, bright and colorful, or quirky, you’re sure to discover the rug of your dreams amongst this list. Happy crafting! Now you can turn your old pairs of jeans into a stunning DIY rug that you’ll admire for years to come! A Pair and a Spare has this easy-to-follow tutorial. Finally, a way to incorporate wildlife into your home décor without the cringe factor! A Beautiful Mess has designed this fun DIY lion rug which is perfect for a child’s room or playroom. These circular woven rugs are very on-trend right now, and the girls from A Beautiful Mess have jazzed theirs up with pom-pom fringing and plenty of bright colors. This rug project is sure to add some cheer to your space! Apartment Therapy has this simple yet fabulous tutorial for sewing together two rugs to create a larger and more eye-catching design. What a genius idea! You would easily have to pay a few hundred dollars for one of these stylish woven rugs, so why not have fun creating your very own and save some dollars? Artistry Interiors has some great tips to help you achieve this. Who would’ve thought that creating a modern and on-trend rug such as this one from A Scoop of Sherbet could be so simple and affordable? Mix and match your favorite colors for a truly unique look. When blogger Bees and Apple Trees discovered this fantastic floral crochet pattern via Mollie Makes, she added her own spin! Now you too can follow the pattern tutorial to create an eye-catching rug just like this. This rug looks like a nautical-inspired peppermint swirl! If you fancy adding this one-of-a-kind rug to your space, be sure to check out this tutorial from Better Homes and Gardens. This DIY rug project from Brit + Co will have you setting aside some time this weekend to visit your favorite material shop. Learn how you can turn your favourite fabric into a stylish rug by following their tutorial! It just goes to show that when you spot a rug you love in a shop but it’s out of your price range, you can re-create it yourself! Burke Lodge did just that and ended up with this artistic masterpiece. Bring a little Hamptons beach style into your own home with this DIY rope rug project from Completely Coastal. Not only is it easy to make, but you’ll probably want to make a few to give to loved ones too! 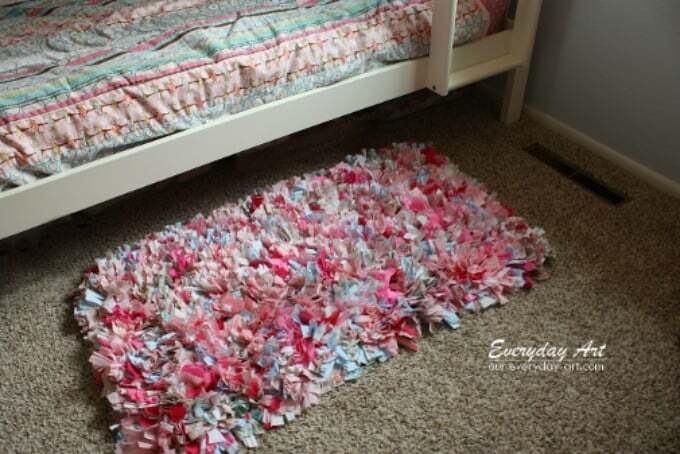 This DIY rag rug from Craftaholics Anonymous is perfect for little ones, as it is super soft, affordable, and easy to create. It’s also the perfect DIY solution for transforming old clothes into something useful. You’ve probably seen rugs just like this one in high-end stores, but the good news is that with a bit of patience and skill, you too can recreate your own! Home Dzine has all of the inspiration you’ll need. It’s time to start collecting corks, because it turns out you can create a very nifty rug out of them! Crafty Nest has this genius idea and tutorial for you. If you’re after an easy and affordable solution to bring color into your home then you’ll love this DIY rug tutorial from Decorating Your Small Space. It looks like a masterpiece! This rosette rug might look fancy, but it can easily be achieved with little materials in an afternoon. Design Dazzle created this for her ‘Mum Space’ – You’ll love it! Isn’t this hand-painted DIY patterned rug from Design Dots brilliant? You can easily achieve this wonderful look within just a few hours – Genius! One of the easiest ways to bring some color into your home or outdoor area is with a vibrant rug just like this one from Design Meets Style. Follow this tutorial to create one just like it! Here’s an Anthropologie hack from Dream Book Design that you’re going to love – turning a beautiful tablecloth into an eye-catching and on-trend rug to jazz-up your space. Beautiful! With a patterned stencil and some spray paint, you can easily transform a basic rug from boring to brilliant, just as Everyday Dishes has done! You’re going to love this step-by-step guide too. This DIY rug idea from Fine Craft Guild is perfect for those who live in apartments and crave the feeling of soft grass underneath their bare feet! Although it’s made from wool, you’re sure to love how comfortable it feels underfoot. This DIY rug project from Flax and Twine looks extremely professional, don’t you think? It’s just one of the amazing tutorials available in Flax and Twine’s book of projects. Perhaps what we love the most about this do-it-yourself rug from Free People is its rustic and bohemian-inspired aesthetic. The pops of color are fantastic for transforming your home too! Here’s another painted rug tutorial, and this one from Home Depot is bursting with color and interesting designs. The best part is that it only cost a few dollars to transform! How wonderful is this gold faux zebra skin rug from Home Depot? It’s another great tutorial which adds that much-needed spin on animal objects for the home. Here’s not one, but two rugs inspired by the brilliant designs of Lulu & Georgia. Homemade By Carmona will show you how she achieved these with her two tutorials!